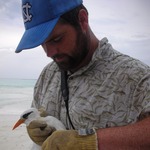 I am fascinated by nesting behavior in birds and have studied Audubon's Shearwaters, White-tailed Tropicbirds, and other seabirds in the Bahamas, Tobago, and around the Caribbean. These seabirds are poorly known, declining, and mysterious. Why do they nest in huge numbers on some islands and not others? How do they coordinate their breeding activities with mates and neighbors? Where do they forage? I have collaborated with other scientists and many volunteer assistants to address these questions since 1998. Board member of Environmental Protection in the Caribbean (EPIC) since 2012. I have published numerous peer reviewed articles, book chapters, and maps on seabird conservation, and I am a master bird bander under the USGS Bird Banding Laboratory. I have banded thousands of shearwaters, tropicbirds, terns, and even a couple of owls under my permit, and I am competent with using Program Mark to analyze mark-recapture data. Getting therespots availableWe are going to run this expedition! Bahamas Coastal Bird Trip is coming up - and your help is needed! We are going to run this expedition! We are very close now - just $120 away. Remember that if we raise more than our goal, the money all benefits the project. Anything more than our minimum will go to help offset costs for volunteers who are going to join in the research or to purchase supplies like bands, mist nets, etc. Good work, flying penguin group. Such awesome birds!